1. Deal with stress by exercising regularly, at least 3 times a week. 2. Keep healthy by getting enough rest and eating plenty of fresh fruit and vegetables. 3. Work through past exam papers. This will help you identify your problem areas and get you accustomed to working with a deadline. You can download the five most recent past exam papers for a variety of subjects by visiting Teach Me 2’s website. 5. Start a study group with friends who are motivated to do well and study hard. After covering the work yourself, meet together and discuss any problem areas you encountered. 7. Think of practical applications for every theoretical concept you study. By doing this you will create associations in your memory, which will help you to recall information more effectively during exams. 9. Keep a positive attitude and believe in yourself! Fear causes your brain not to work as effectively as it should, so if you’re able to keep calm, you will retain more information while studying and recall it effectively during exams. 10. Hire a tutor to help you with your toughest subjects. A lot of students struggle with one or two subjects e.g. Maths and Science, which can negatively impact on their overall results. 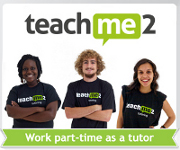 For finding a top tutor, check out Teach Me 2, a private tutoring company. They’ll match you with a tutor to help you achieve your potential and gain confidence in those difficult subjects. Visit Teach Me 2’s website to get a private tutor.